Festool has solved the problem of vacuum hoses abrading the edges of your workpieces by encasing the hose in a protective sleeve. They call it the Sleeved Antistatic Hose. 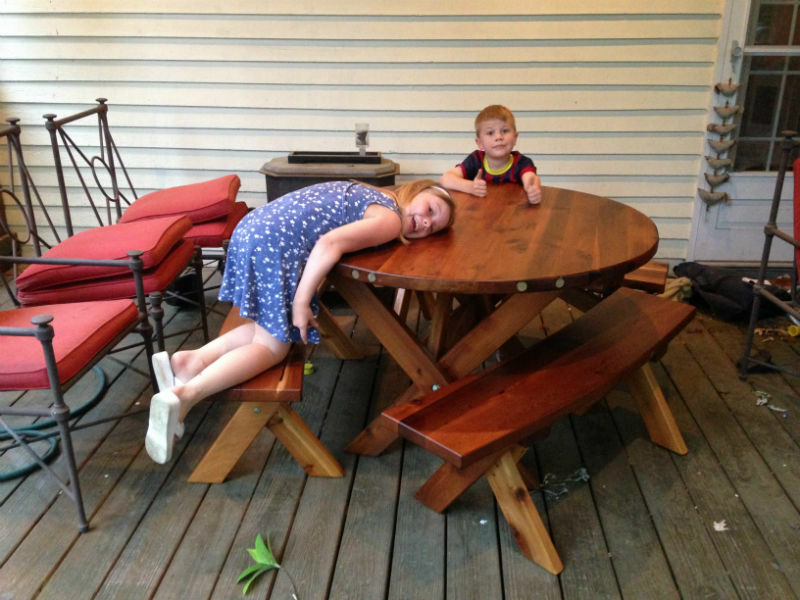 I ran into those very problems when I was making the round cedar picnic table pictured below. Sanding cedar can be very tedious, as the wood is soft but the knots are hard. As I worked out little defects, I had to sand a bit, vacuum, examine, then sand more or move on to another defect. At that time, I didn’t have a dust separator on my Festool Dust Extractor, but I did have one in the ceiling, attached to a little Shop Vac Hangup. almost anywhere I do benchtop work in my shop. As it happened, though, I was working at the extreme end of the length of the hose when I had the tabletop balanced on its edge on the floor. Thus, every time I stopped vacuuming, the hose wanted to recoil out of reach. A couple of clamps solved the problem. I got a big squeeze clamp that would accommodate the diameter of the hose without crushing it, and another clamp to hold that clamp to a nearby table. Voila! 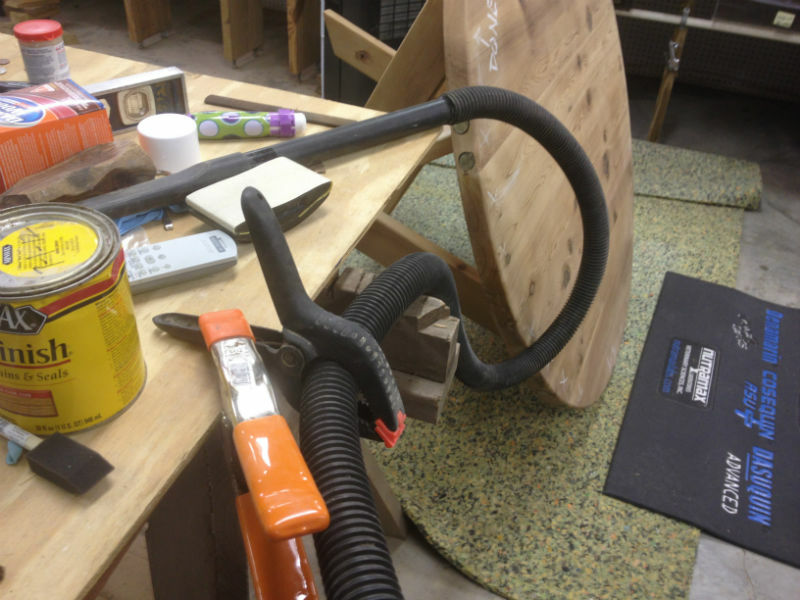 The last 18 inches of the hose were handy when I needed to remove dust, and out of the way while I was sanding. A couple of inexpensive squeeze clamps and my hose was both protected and available. Of course, Festool has that covered now, too. 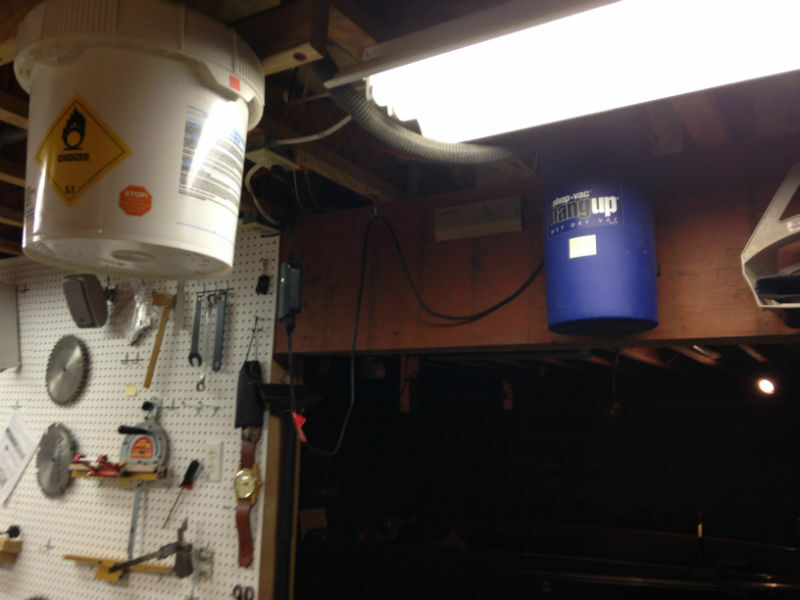 Any current model of dust extractor can be retrofitted with a Bluetooth remote control. You can even mount the remote switch on the hose, so it’s always handy! Click here to order or learn more. You want even more? How about a dust separator that mounts right on your Festool extractor? Yep, they have that, too, click here. Then click here to watch a video, and prepare to be amazed at how flexible this little addition is. Now, if I’d just had all that when I was working on the table. It might not have taken me 18 months to finish!